Practicing Chiropractic & Acupuncture in Raleigh for 25 Years! At Midtown Chiropractic & Acupuncture, we address the cause of your pain, not just the symptom. Call today! At Midtown Chiropractic & Acupuncture, we address the cause of your pain, not just the symptom. Call or email us today! 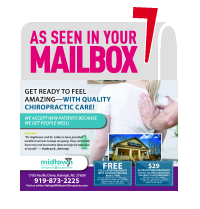 Welcome to Midtown Chiropractic & Acupuncture located at 1705 Pacific Drive in Raleigh, NC. We understand that choosing a chiropractor is a big decision. This article will help you learn the basics of chiropractic care. Please don't hesitate to contact our Raleigh chiropractors with any further questions you have. We are here to help you achieve your goals. Your spine is designed to protect your spinal cord. Your spinal cord is responsible for moving information from your brain to the rest of your body. Your spine is the protective case for one of the most important parts of your body, and a Raleigh chiropractor can help you maintain it. Is chiropractic the right treatment for you? Call our team at Midtown Chiropractic & Acupuncture in Raleigh. We will do our best to help you reach your goals. That's a lot to take in, but it is the explanation as to why some chiropractic patients in Raleigh report improvement in body function. This is not a claim that chiropractic adjustments treat disease, but it does suggest that some people will see improvements in conditions outside the treatment area. Most patients don't realize how much education chiropractors in Raleigh have. Chiropractors are held to some of the most intense educational standards of any health field. In fact their education standards are very comparable to that of a medical doctor.